Bellerive’s Hospital recently got a virtual tour which was entirely created by globalvision. Bellerive, one of the Geneva University Hospital (HUG), specializes into medical rehabilitation and palliative cares. From an aerial point of view, explore the different services that form Bellerive’s Hospital. From your home, visit the physiotherapy and ergotherapy rooms, and the different kind of dorm rooms: from simple and double to studio. Virtually enjoy all the commodities: garden, patio and dining room. 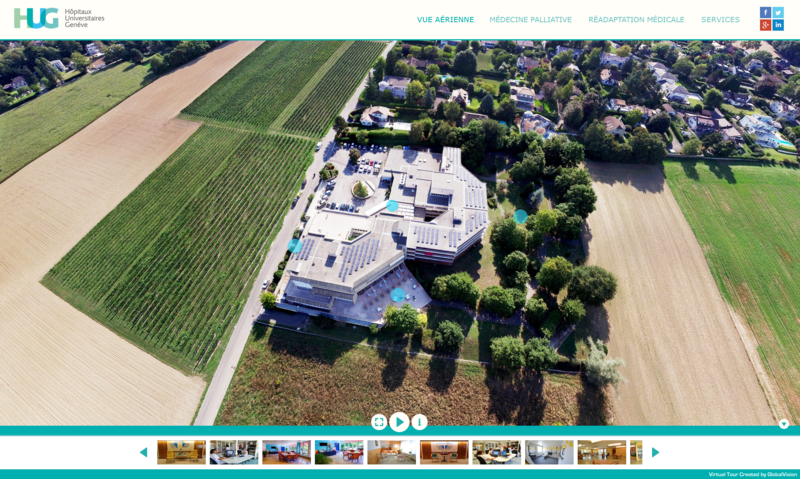 globalvision has already created more that 20 virtual tours for the different services at the HUG, such as the maternity unit, the radiology department or even the ophthalmic surgery. The virtual tours allow the users to instantly discover places without being there for real. Contact globalvision to schedule a virtual tour.